Thanks for checking out the site! I want to take a minute to explain a couple of things. I know, I know, a website with instructions, but until I figure how to do without, here you go. First, What is the Five Fold Bible? Great question. Is it a new translation of the Bible? No. Is it a bold challenge to strongman fold a Bible in half five times? No. Sorry, but if you manage to actually do that please put it up on Youtube and shoot me a link! You may already know this stuff as APEST, the acronym for the the passage above. It’s also discussed as five fold, and most recently, Alan Hirsch has written a new book where he expands on the idea theologically and re-brands it “5Q.” There’s a ton more writing on the new 5QCentral blog, where I’m a regular writer as well as Editor-At-Large. 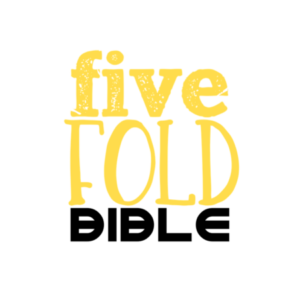 On the FiveFoldBible.com, I’m going to focus on analogies and illustrations that help explore, develop and provide practical ways to see the five fold gifting come alive in your study, life and ministry. You will discover these things in the regular posts. I’ll also explore individual scriptures through each of the distinct lenses of APEST. In these posts, you will find a preaching approach to the passage – a way to communicate the passage from the APEST perspective. You can look here for a good example. Notice the three “preaching” points drawn from each passage from each of the five APEST perspectives. Also, you can find illustrations that re-enforce points from contemporary culture. These post are meant for study; to inspire your ideas. Last thing. From time to time I’ll drop a random thought on the more informal blog: Guerrilla Wordfare. Links to non related APEST stuff, other things I’ve written or am working on. So that’s about it. Thanks for checking out the site. Make sure to Subscribe below if you want all this yummy awesomeness dropped hot into your inbox. Oh, and follow on Twitter. Oh, and you can catch me on Facebook. Oh, and that is all, folks.